← Racers practice. Why not speedway firefighters? This photo followed a checkered flag many decades ago at Quad-City Raceway in East Moline, Ill. 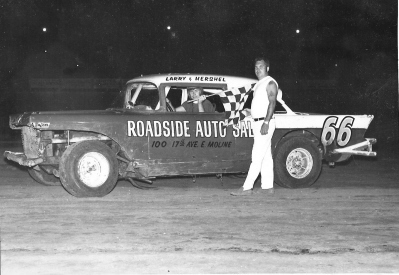 Shown with driver Hershel Roberts is flagman Skip Chick. Doug Haack’s Vintage Racing Photos. Ray Guss Jr. will drive this machine, owned by Hershel and Ken Roberts, much of the time in 2010. Phil Roberts photo. 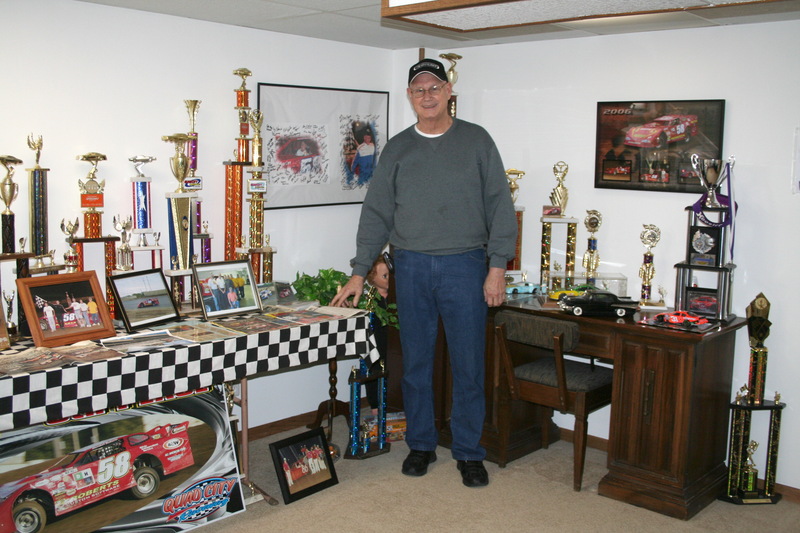 Hershel Roberts poses with a few of the hundreds of trophies he has won over the years. Phil Roberts photo. He’s an inspiration for anyone fighting any sort of problem, medical or otherwise. He’s upbeat, and he’s always smiling. To visit with him, you’d never suspect that Late Model racer Hershel Roberts has stage 4 terminal cancer. In January 2006, when Roberts received the diagnosis, his doctor told him he had between six and 24 months to live. But the retired UAW representative from East Moline, Ill., had other plans, and he’s still here. Aggressive cancer treatment certainly gets much of the credit for beating the odds. But his friends believe his desire to race also has kept him going. Roberts began racing in the late ’60s. His is a familiar theme: He had watched others compete and thought he could do better. The first race he ever won was a Figure 8 event where he got spun out on the last lap and backed his car across the finish line. 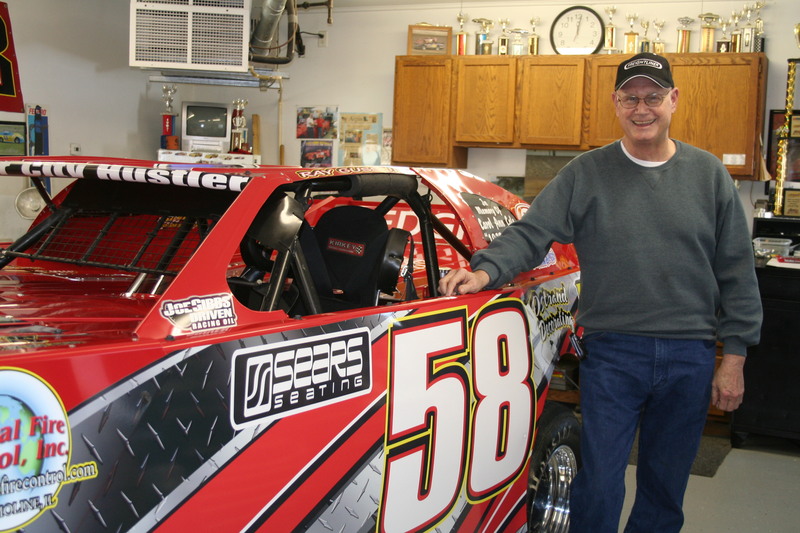 Before moving to Late Models, Roberts ended up winning seven Figure 8 track championships and one Novice Division championship. Despite the dire diagnosis he received four years ago, Roberts decided that cancer wouldn’t keep him out of the driver’s seat of the car he co-owns with his son Ken. When doctors needed to implant a port for chemotherapy medication, Roberts had it placed where it would not interfere with his seatbelt or shoulder harness. Roberts knows cancer will eventually take him. But until then, he’s been living life as normally as possible. “I’m going to do what I feel like and stock car racing has been a big part of my life for years, and I’m going to do it as long as I can do it,” he has said. This season, as was the case in much of 2009, when he was plagued with side effects from chemotherapy, Roberts is turning much of the driving over to his longtime friend, Ray Guss Jr. The Roberts/Guss team raced 38 nights in 2009 and walked away with 14 wins, 15 seconds, two thirds, two fourths, a ninth and only three DNFs. Five of those wins came in the IMCA Deery Brothers Summer Series, which is their main focus this season. But when the Summer Series schedule permits, Guss will drive on Friday nights in weekly IMCA-sanctioned events at Davenport (Iowa) Speedway in an attempt to win his second consecutive track championship there. On Saturday nights, they’ll compete in IMCA races in Maquoketa, Iowa, with Roberts behind the wheel. Or they may show up now and then at West Liberty, Iowa, with Guss likely doing the driving. Roberts knows the cancer, which is spreading, will eventually take his life. But he says he believes in eternal life and has come to terms with dying. “I’m OK with it,” he says with a smile. Copyright 2010 by Phil Roberts, Creative Enterprises. This article appeared in the June 2010 issue of Late Model Illustrated. Read this article. Go to bing and type up Hershel Roberts racing legend.